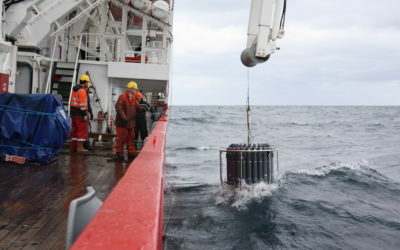 BAS > News & media > Latest blogs > SCIENCE IN THE SEA – Part 1: Journey to the JCR! After 6 days, 9505 miles and 7 mm of beard growth, the cruise has officially started! Thursday 16th November and finally the time had come for me start my journey south to Antarctica! 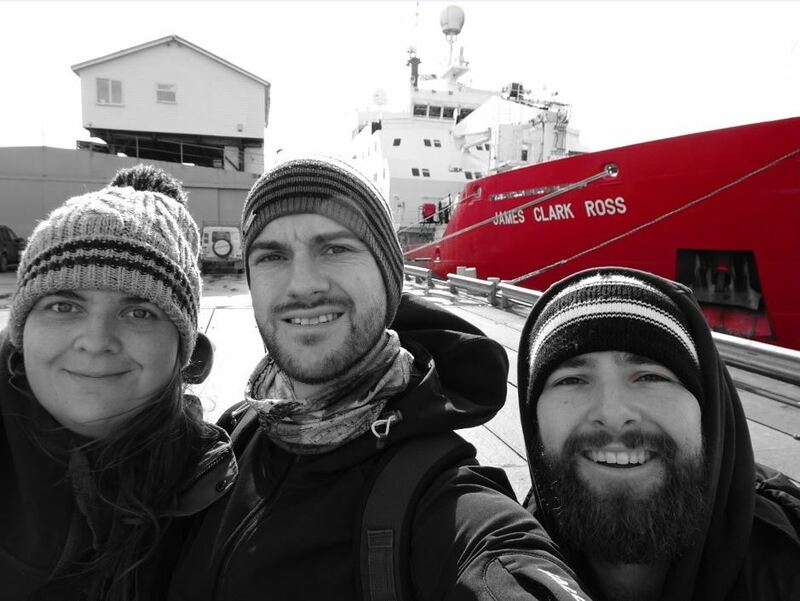 It was time to set off on the long trip to the RRS James Clark Ross, which is affectionately known as the JCR. The taxi from Cambridge to Heathrow seemed relatively short, compared to the next two steps on my travel itinerary. First, we caught a 12 hour flight to São Paulo in Brazil and then a 4.5 hour flight from São Paulo to Santiago, Chile. Our next flight wasn’t until early the next morning, so after checking into our hotel a group of us went to explore Santiago. This turned out to be more complicated than we’d imagined as none of us spoke Spanish and the driver (understandably) didn’t speak English! At 4am the next morning we were up to catch a flight to Punta Arenas in Chile. At last, the final leg of our journey was upon us, just a short 1.5 hour flight to the Falkland Islands. Arriving at the military airport, we were greeted by weather which was surprisingly similar to the UK – rain and temperatures around 12°C. We travelled by taxi to the Falkland Islands capital, Stanley. The route was mostly along a gravel road which took us through old minefields and moorlands; the experience very much reminding me of Dartmoor! After roughly 9505 miles we had finally finished our conventional travelling and most importantly managed not to lose any luggage! 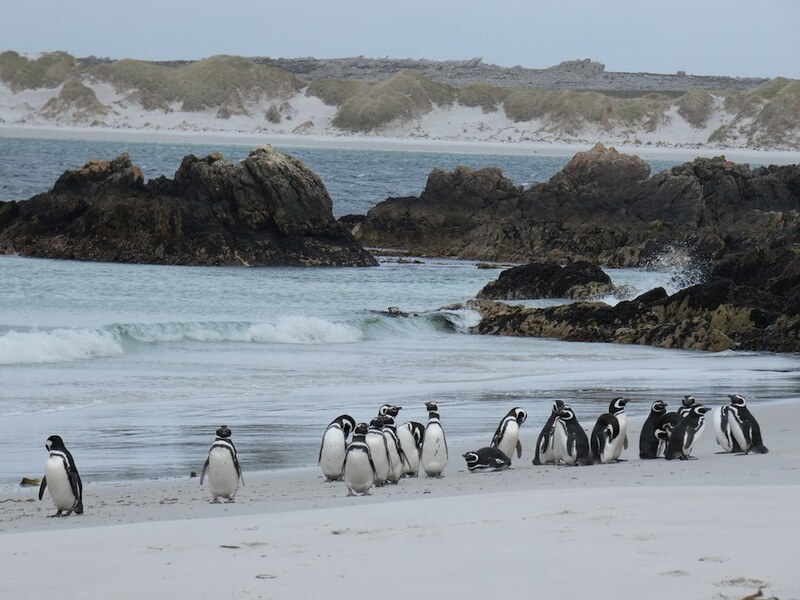 Although Stanley is a small place, the walk along the main street is only about 5 minutes, it is known as the “Gateway to Antarctica”. 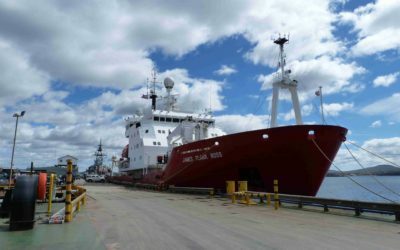 The Falkland Islands capital is the main port for the JCR, therefore, it is very important for BAS and the scientific community! Seeing the ship for the first time I was awe-struck, in front of me was the world-class research ship that was to be my home for the next month. I feel excited to start the cruise and proud that I am one of the lucky few who gets to go and do science in Antarctica. Scientists admiring their home for the next month.  From left to right: Rachael Sanders, Dafydd Stephenson, Ryan Scott. Photo Credit: Rachael Sanders. 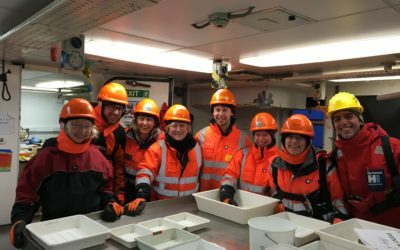 On this cruise, the science party is made up of three teams. I am part of the underwater glider team on the cruise, onboard the JCR we will be deploying ocean gliders to collect data as part of the ORCHESTRA project. 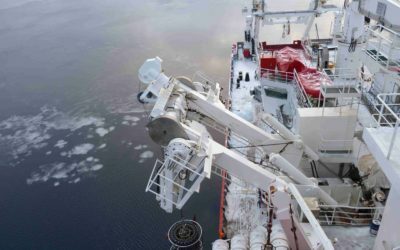 We will work closely with the hydrography team, who are also collecting data as part of ORCHESTRA. 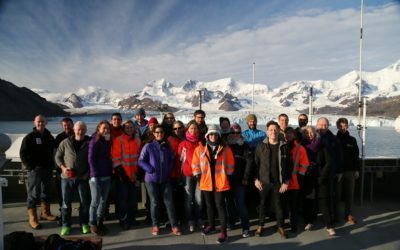 The biology team is working towards the ICEBERGS project, which aims to look at the response of sea life to glacier retreat along the western Antarctic Peninsula. 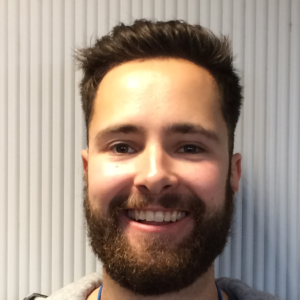 I think the two projects are both really interesting and I’m looking forward to seeing how the science progresses… stay tuned!